HE EXCITEMENT we’ve all seen on the faces of people in St. Peter’s square the last few days is appropriate. It is never good for a family to be without a father for long, so joy and gladness are the right reaction to the election of a new Holy Father (even during Lent). 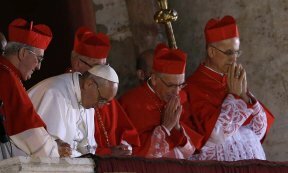 One of the moments that seems to have most moved onlookers was the new Pope’s request for the prayers of the people before giving his first Apostolic blessing. Two things impressed me about this particular action. First, the pope asked for God’s blessing. Speaking in Italian, the new Holy Father said, “Pray to the Lord so that He blesses me.” As he embarks on his new mission, Pope Francis realizes that he needs the blessing of Almighty God. I pray that he will have it. Secondly, the pope asked for our prayers. Notably, he did not ask for the blessing of the crowd. Blessings come to us only from God directly or through the hands of an ordained minister. But the prayers of our brothers and sisters in Christ are, indeed, powerful. That moment of prayer on the balcony of St. Peter’s is very similar to an exchange that occurs four times in every Mass. When the priest says, “The Lord be with you,” it is really a prayer, asking that God would be present with all those in attendance. The people respond, also, with a prayer: “And with your Spirit.” The people’s prayer asks that the Lord would be with the minister, particularly in his role as a minister—a “steward of the mysteries of God” (1 Corinthians 4:1). This action is bound to be interpreted variously. I see in it an expression of prayerful Christian solidarity ordered toward the reception of a unique blessing. May God’s blessing, which has come to us at the hand of Pope Francis, bring forth abundant fruit.